80'z Enuff was spawned in the winter of 2003 by Shannon Gilbert, who'd spent the better part of a decade knocking around the southeast with various touring bands as a singer/guitarist/bassist. Finally, Shannon decided the time was right to boldly strike out on his own to assemble an outfit that would raise the bar and truly present what he thought the Eighties were all about -- high energy, high production value, and high musicianship. 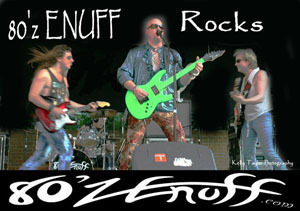 Shannon's initial incarnation of 80'z Enuff toured for nearly a year until he decided that changes needed to be made to the lineup if his vision was to be realized. Nathan Blankenship, Shannon's former partner-in-crime in several previous bands, was recruited to help front the band as bassist and co-lead vocalist. Also coming on board was drummer Chuck Barchuk, whose jazz background and rhythmic diversity coupled with Nathan's hyperactive bass riffs would help to provide the rollicking grooves 80'z Enuff is known for. Having addressed the issue of improved musical presentation, the band quickly turned their attention to creating a state-of-the-art production & show that truly embodied the Eighties experience Shannon had originally intended. Nathan's experience as a lighting designer would prove invaluable in assembling and programming a computerized concert lighting system as well as a multimedia video presentation while Shannon turned his attention to creating the most intense P.A. money could buy. In 2005 the band decided the time was ripe to add another guitarist to fatten their live sound and contribute in the vocal department. While their initial choice for this position proved to be short-lived, the positive fan response to the addition of a fourth member convinced the band to spin the wheel and try again. This time they came up aces, adding Jay "SnakkDaddy" Rusnak, who was fresh off a stint with former 80's vocal legend Ron Keel. Jay's flashy guitar and take-no-prisoners stage presence would prove to be the missing piece of the 80'z Enuff puzzle. In late 2007 after nearly two years with this lineup, Chuck Barchuk would be the next to depart in order to pursue a wider range of musical avenues. Shannon wasted no time recruiting ex-Patrick Rock drummer Jason Blaustein who quickly served notice that his patented brand of thunderous grooves would enable the 80'z Enuff juggernaut to keep rocking and rolling without a hitch. Providing top-notch entertainment and a true Eighties experience, 80'z Enuff currently performs over 100 shows a year across the southeast. As they head into 2008, the band is gearing up to to take their production and presentation to new heights while continuing to establish endorsements with top musical manufacturers and expanding into fresh geographical markets. New dates are being confirmed daily and the band's rabid fanbase continues to grow with each off-the-hook show. If you are looking for a party that is second to none, then you need look no further than to 80'z Enuff! Review: If your into 80's jams, like myself...then check these dudes out. I saw them awhile back at AA's and had a good time. Great songs, good sound quality, and dude with the big hair even solo's the bar runway... I give a 4 because it is a cover band, but much better than the local cheesdick cover bands..